1. Preheat the oven to 180˚C, gas mark 4. Use a pestle and mortar or a small processor to mix the garlic cloves with the cumin seeds to form a paste. Work in the lemon juice, half the oil and seasoning, keeping the mixture thick, then rub into the lamb. 2. Heat a non-stick frying pan and quickly brown the lamb racks on the top side. Arrange browned-side up in a small roasting tin and cook in the oven for 15-17 minutes for pink, or a few minutes longer for well done. Leave the lamb to rest for 5 minutes, in a warm place. 3. Heat the remaining oil in a small pan and add the onion. Cook for 1–2 minutes over a low heat until starting to soften but not browned. Add the balsamic vinegar and simmer for 30 seconds, then add the cranberry sauce and warm through. 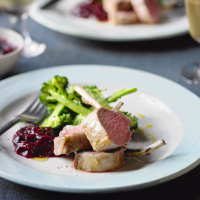 Serve with the lamb, cut into cutlets. Lovely with purple sprouting broccoli, and dauphinois potatoes.